Our first stop was the flavored churros by ‘Bakes and Crafts’. The Classic and Cinnamon flavours are the regular ones. They also have new types of flavours on display like the Red Velvet churros and Pandan Churros. You can choose your combination of churros along with a dip of your choice. 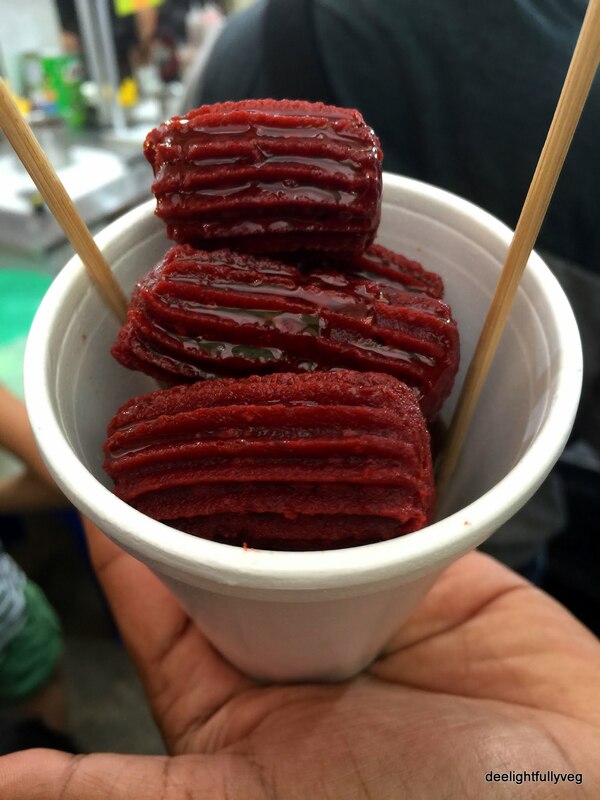 We ordered the ‘Red Velvet Churros with Gula Melaka’ which was absolutely fresh and crunchy. We could not stop ourselves from drinking the Gula Melaka at the end as it was quite tasty. Highly recommended. Attached to the churros stall, is the ice cream stall which had one of the longest queues in the bazaar. Since we were lucky with our timing, our wait time was only 20 minutes at Happy Rollies. With such a happy name, they were definitely on a roll with their ice cream rolls. It was very exciting to see the preparation process and the way it gets frozen. Our order choice was ‘Oreo and Strawberry’ which was one of the recommended combinations. The ingredients got sliced and mixed along with a liquid batter. In some time, it was spread across the surface and rolled. 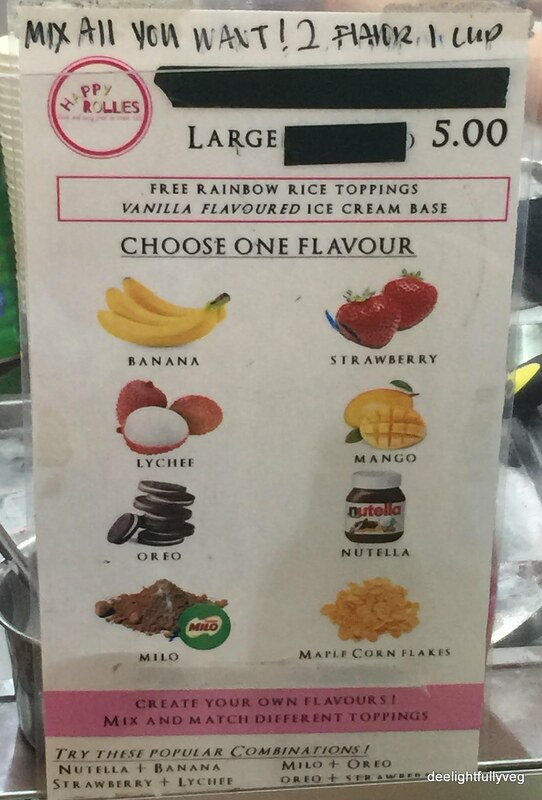 Among the toppings you have choices between rainbow rice toppings, nutella and cornflakes. 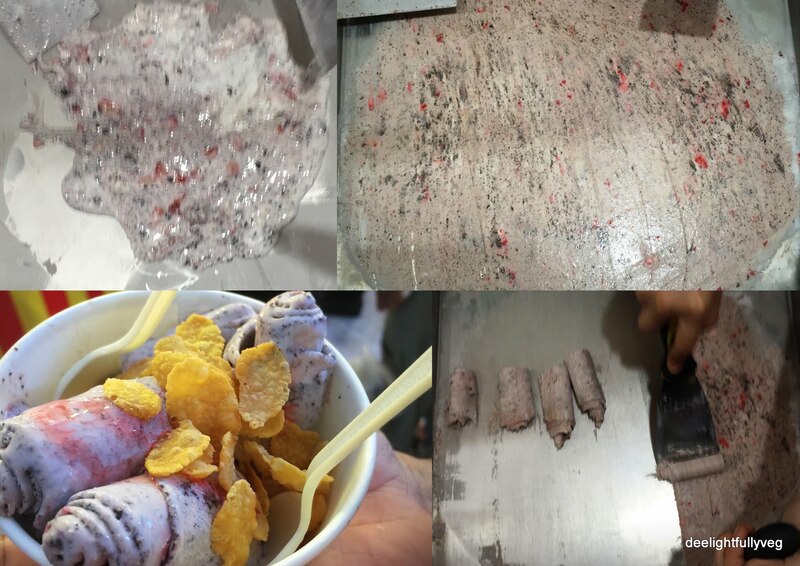 We chose strawberry sauce and maple corn flakes as our ice cream roll toppings. The cornflakes add a nice crunch and we enjoyed our ice cream. Make sure you eat the ice cream soon, especially in this hot weather. It was a pleasant surprise to see one of my favourite coconut ice cream stalls at this bazaar. You can read my earlier review on Kala Thai ice cream here. Do try it and enjoy this authentic dessert. Though there are few options in terms of vegetarian food, it is just nice to see a bustling bazaar in all its glory. For a totally new experience in terms of a huge bazaar and new food variations, Ramadan Bazaar 2015 is totally worth a visit. The Bazaar is on display till 16th July – visit it soon! 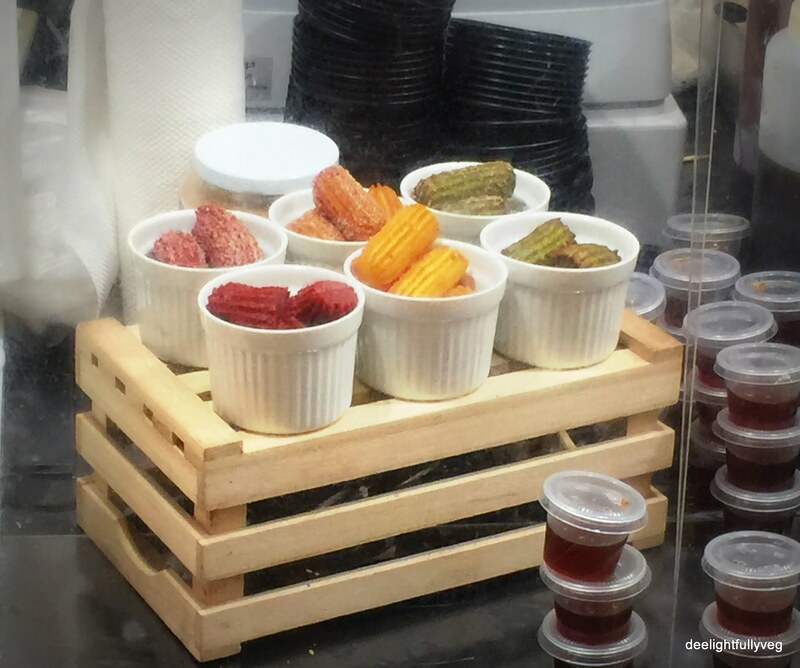 Posted on July 4, 2015 by deelightfullyveg	• This entry was posted in Restaurants and tagged Bazaar, Geylang, Paya Lebar, Stalls, Vegetarian. Bookmark the permalink.